A delight for the entire family, the Year of the Rooster combines the elegance of traditional Asian art and the beauty of American modern dance with thrilling choreography, exotic music and dazzling acrobats to celebrate the Lunar New Year. Nai-Ni Chen Dance Company presents an award-winning event that brings audiences close to one of the world's most celebrated festivals, China's Spring Festival. Year of the Rooster features the exciting sights of dancing lions and dragons, the lilting sound of Chinese pipa and erhu, and the vibrant, gold and red costumes and props. Enjoy demonstrations and fun activities staged in the lobby before the performance. 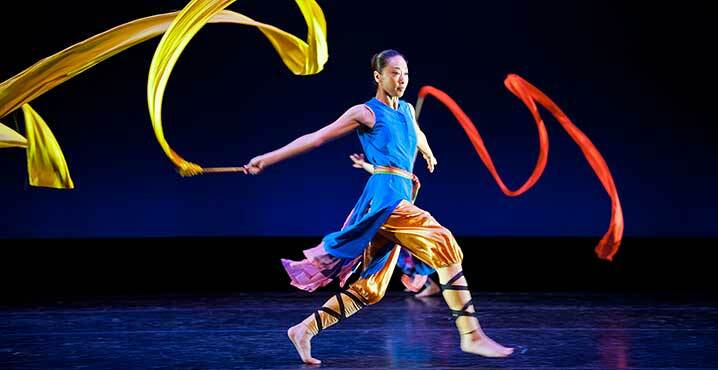 Bringing the dynamic freedom of American modern dance together with the elegant splendor of Asian art, the Nai-Ni Chen Dance Company is one of the most visible Asian American dance companies in America. Their unique choreography transports audiences beyond cultural boundaries to the common ground between tradition and innovation, discipline and freedom, and form and spirit. Since its inception in 1988, the Company has been presented by some of the most prestigious concert halls in the United States, from the Joyce Theater in New York to the Ordway Center in Minnesota and the Cerritos Center in California. The Company has also mounted more than twenty national tours and nine tours abroad. The Company is led by choreographer and Artistic Director Nai-Ni Chen. She presides over one of the few professional touring Asian American dance companies that is led by a woman in the United States. Since the inception of her Company in 1988, Chen has created a wide-ranging repertory, from dances that originated thousands of years ago to highly abstract, modern works. Coming from a rich dance tradition, Chen was a renowned traditional dancer in Taiwan and served on several ambassadorial culture missions to nineteen countries around the world. An early member of the Cloud Gate Dance Theater in Taiwan, she came to America to seek her own voice in the world of contemporary dance. The highlights for this year's program begin with Double Lions Welcoming Spring. As one of the most popular dances performed in the Chinese New Year Celebration, the Lion Dance is said to have originated in the Tang Dynasty 3,000 years ago. The Emperor would hold a festival where people dressed in costumes as one hundred kinds of animals, the lion being one of them. The Lion Dance is seen as a prayer of Nai-Ni Chen Youth Program Dancers for peace. During the dance, a child playfully leads a beast, symbolizing harmony on earth. That is why the Lion Dance is always performed in the beginning of the year. In this dance, acrobatic skills, coordination and concentration are critical. There are many styles of the Lion Dance in China; this is the Northern style. Peacocks Under the Moonlight focuses on the more than 55 ethnic groups living in China, each with their own unique dances and music. The peacock is considered a sacred bird among the Dai people in the Yunnan province. Because of the performers' supreme grace and elegance as peacocks, this dance is one of the most beautiful from that province. Many of the movements in this piece derive from real actions of the peacock, such as drinking water, walking, running, and grooming its feathers. The solo musical instrument- hulusi was originally used primarily in Yunnan province by the Dai and other non-Han ethnic groups but is now played throughout China. Like the related free reed pipe called bawu, the hulusi has a very pure, clarinet-like sound. Meet at the Aobao is a famous Mongolian folk song in China, which almost all Chinese people can sing. The song describes a young fellow anxiously waiting for his girlfriend beside an "aobao" on a peaceful night under a beautiful full moon. An aobao means "a stone heap" in Mongolian language. An aobao is made of three layers because Mongolians take three, six and nine as auspicious numbers. So the aobaos are also in groups of three or nine. In the grasslands, people are apt to lose their way without signposts, so the aobao was born as a landmark for the grasslands. Nowadays people still live there and always say, "Turn left at the third aobao" or others. Also, young people make the aobao a sacred and romantic meeting place. The Flying Goddess, or The Ribbon Dance, can be traced back to the Han Dynasty in China over 2000 years ago. This dance is inspired by the flying goddesses painted on murals discovered in the caves in Dunhuang City. Dunhuang City is known as an important historical site from the fourth century when artists find sanctuary in the caves and created the art work based on the stories of Buddhism brought back from India through Silk Road. The ribbon symbolizes the wind, clouds and rainbow that move with the goddesses as they travel through the sky, spreading the blessing and power of healing to the suffering world. Yung Ge is one of the most popular folk dances of the Han people in Northeast China. During harvest time or the Lunar New Year celebration, villagers gather in the fields and dance with fans, handkerchiefs and drums to celebrate their year-long hard work and to welcome the New Year. Their movements are very stylized and energetic and are usually performed to a repetitive drum beat. Way of Five - Earth is the result of Nai-Ni Chen's third exploration of the ancient Chinese theory that the cycles of creation and destruction correspond to the ever-changing phenomena of nature. The 'Five' refers to the five elements: Wood, Water, Fire, Metal and Earth. Each element, as part of the forces of nature, creates another in harmony and destroys another in conflict. This exploration is focused on the element Earth. As the most spectacular folk dance performed in the Chinese New Year Celebration, Dragon Dance depicts a mythical animal, which symbolizes imperial power and nature's grace. For those fortunate to see it in the Chinese New Year, prosperity and good fortune is ensured for the coming year.